You have an e-commerce website integrated with the local delivery company. The thing is that all the address’ fields should be filled in Cyrillic as this is the expected input. Any Latin input will break the delivery service. So you need to make sure that only Cyrillic characters are used. You can check it how it works on this jsfiddle. each typed character that is not included in the regex above is deleted form the input. That’s all, but don’t forget that there should be also server side validation. 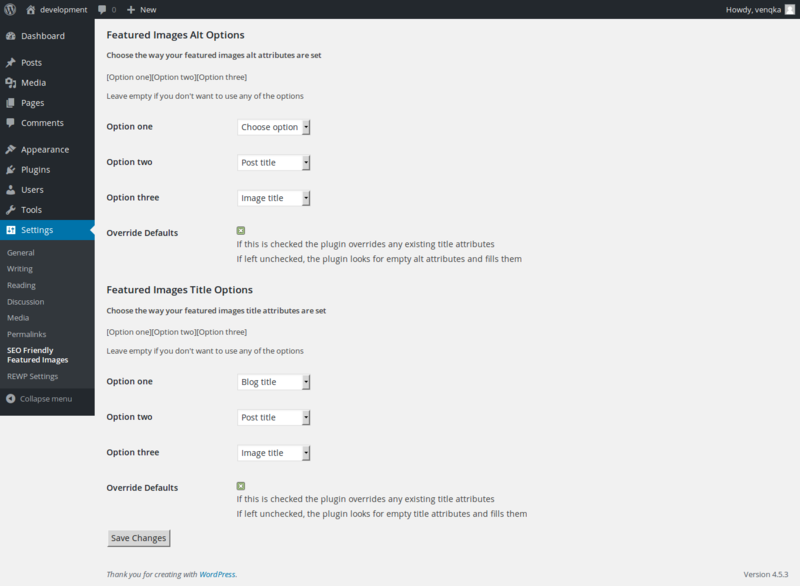 Creating custom settings/options page in wordpress admin panel is an easy task if you know what you’re doing. Here is a step by step tutorial on that. The function that creates our settings page must be hooked to amin_menu. There are minor differences between add_menu_page and add_optons_page (add_menu_page accepts a few more parameters), but in our case the parameters are the same. Now it’s time to create our options and fill our settings page with them. We will be using a few functions which will take care of the whole process. We will start by adding capabilities check and a form to our rewp function. The method must be post and the action – options.php. Now the only change is a button “Save Changes”. This is because we don’t have any options yet. To create options we will use register_setting, add_settings_section and add_settings_field. To begin we create a function called rewp_options and hook it to admin_init. register_setting adds a setting to a group (the first parameter. We use it in add_settings_fields), creates a row in wp_options (second parameter) and can take a third parameter generally used for data validation. add_settings_field is the option. We need to give it id, title, section and callback. After that we can create the options. We create our add_settings_field callback functions and write our inputs in it. For security purposes we need to do a few more things. add_settings_field creates a nonce hidden field and saves us the trouble. We still need to validate and sanitize the data that goes to the database therefore we have to create a function which executes just before the settings are saved. register_setting’s third parameter is the name of such function and we can use for handling security. As a result only the whitelisted options will be accepted and saved in the database. Any other input will trigger an error. For better WordPress onpage Seo we need to give our featured images alt and title tags. Unfortunately we can’t use out of the box tools for this (yet). We are working on a flexible and customizable plugin that will make this task a piece of cake. Here is a sneak preview of it’s options page. Sometimes websites look as intended on all browsers except IE. To solve this problem we need to write IE specific css. If you want to have css styles that target only IE ( works for IE10+ ), you can use a Microsoft-specific media query. It is recognized only by IE. Upon download, you are getting 30 Megabytes (!!!) of 6323 (!!!) files just in the plugins/jcatalog folder. WordPress alone is 18.3 Megabytes and 1216 files. The plugin checks if you are using WordPress or Joomla. So it could work for Joomla with the same code base. “Sweet”, eh? After you install the plugin, you get 3 folders of the plugin in WordPress root (why?! ), with overall size of 27Mb and 6463 files. Sounds like a cancer to me. These are “cache”, “tmp” and “joobi”, the latests being with tons of php files inside. Getting around 160 new tables in the database does not seem like the best idea ever. Deactivating and activating the plugin again, as well as activating it on several subsites in a Multisite installation leads to loads of warnings and notices. I should report them in the support forum, but am a bit not sure if it’s worth the effort, as the authors didn’t do the effort to test these things on the first place. If you want to have a CMS inside the CMS, something like the Alien, but in PHP, written by Joomla* developers, then I can’t recommend this plugin enough to you! *I don’t have any prejudices neither on Joomla, nor on it’s developers. It’s just the standard of development that is different. If you are not looking into your code, you should be just fine. This review was originally posted by me on WordPress.org. Plugin version is 1.10.8, WordPress was on 4.5.2. Staging site is the one that you’ve been developing as a redesign of the live site, that has been active till now. Install Duplicator plugin on your staging site and run a full backup generation with it. Ignore warnings on the scan step, in most cases they are related to big files, big overall size of the site or other things that are not lethal. Make a backup of your live site (either by using Duplicator, or any other mean that you are comfortable with). Create a new database from cPanel of your hosting, create a new database user, and add full privileges for that user on the database you just created. Move the contents of your live site to a hidden subfolder (e.g. oldsite) and then copy your staging site package and installer.php that you got from Duplicator in the main folder of the live site. Access your site on http://yoursite.com/installer.php and follow the instructions, using the credentials of the newly created database and user when requested by the installation wizard. After finishing with installer.php, you should be done with the migration. Furthermore, you can read about it in the session_write_close() function reference page. How we found this? We had slow loading of some admin pages (Plugins, All Pages) in WordPress and every time P3 Profiler was pointing to a different plugin, but never the real source of the problem. After enabling slow execution log in PHP-FPM, we found out it was exactly session-start, combined with some ajax calls. This was marked as “won’t fix”, probably fixed at some of the currently used PHP versions but I’m still not aware if this is true. What if you have a very old WP site and suddenly you decide to update everything and in the middle of everything you suddenly get a white screen. The Great White Screen of Dead. No error messages are displayed and the console is empty as hell. The only thing you get in the web tool of your web browser is 500 Server error. Ok, that is something. So you will need so FTP access. Then go to the wp-content and look for the debug.log file. This on records all the apache errors that your server is getting. Open it and go to the end of the file. There check with the time you have tried to access for the site and see the log from this time. Its telling you what is causing the problem. In most cases it is a problem with the new update of the plug-in, an error due to old php version on your server or something like this. To fix it – just go to wp-contnet/plugins/the_problemed_plugin and rename its folder or just deleted it. An that is should fix it. If you want to limit just any file from being accessed from anyone, just use “./*” instead of the regular expression.